In the first column, I posed some key questions and shared my own experiences related to being a leader of curriculum, instruction and assessment. Curriculum leads are constantly painting the picture of a shared vision for the integration of curriculum, instruction, and assessment, all the while trying to keep up with changing state standards and assessments (ready or not, here we come, Iowa Statewide Assessment of Student Progress!) In the second column, we considered how curriculum leads “assure all educators’ ability to use data to inform, implement, monitor, and evaluate results-based decisions” through tools such as innovation configuration maps. The curriculum leadership journey continues in 2018-19! This week, we’ll be taking a closer look at what it means to be a leader of processes. “Curriculum leads establish and monitor common practices and procedures to assure alignment and achievement of initiatives and plans with district and building goals.” Perhaps the most tangible example of this function in action is the teaming structure of a building or district. Whether data teams, collaborative learning teams or achievement teams are the structure of choice, the common goal is to create a community of adult learners who are focused on ensuring students learn at high levels. Curriculum leaders can and should play a key role in these teaming structures. Rather than merely requiring agendas and minutes from each team, curriculum leads might map out differentiated deliverables throughout an academic year. For example, elementary teams could share a summary of the data used to identify students in need of reading intervention on a monthly basis. A secondary science team working through the Next Generation Science Standards likely has a list of revised units and assessments which would serve as evidence of collaboration time well utilized. Moving beyond “pockets of excellence” should be a common talking point for curriculum leads embracing their role as leaders of processes. Dr. Thomas Guskey (2000) suggests school leaders consider five critical levels of evaluation: participants’ reactions, participants’ learning, organization support and change, participants use of new knowledge and skills, and student learning outcomes. While professional learning alone that directly affects students learning may be viewed as the holy grail because it is often a costly and time-consuming process to isolate and track down the necessary information, this does not mean schools should give up evaluating professional learning efforts all together. As a leader of processes, curriculum leaders take the time to plan desired student learning outcomes and then work backwards to identify adult knowledge/skills to be acquired, organizational supports, and related learning activities. Following each professional learning opportunity, participant reactions and levels of learning might be captured through a tool such as Google Forms or SurveyMonkey. In addition, classroom observations should be scheduled to note the degree to which participants are applying newly acquired skills. For example, at my former school district, principals and instructional coaches scheduled classroom observations to follow-up on a multiple year reading-in-the-content area initiative. Using information from these observations and participant reactions captured via Google Forms, we were able to plan future professional learning opportunities that targeted areas of fine tuning. In closing, curriculum leaders who value improving processes in a school district invest their time in structures to ensure each professional learning opportunity counts. This function requires a leaders to think of change as a process rather than an event, such that each professional learning opportunity builds on the previous one, using multiple sources of data in the planning process. For the past fourteen years, I have worked in the Solon Community School District (Solon, Iowa). When I interviewed for a teaching position in 2004, I had no idea Solon would be such a wonderful place to work. During that interview, I found out the high school building was only a few years old and principal at the time told me there were occasional “Taco Tuesdays” in the staff lounge, so it sounded like a good place to land a job! Beginning with my first months as a teacher, and later as a district administrator, I am grateful for the way Solon staff allowed me to ask lots of questions and learn from making (many) mistakes. Solon is a tremendous place with high expectations for adults and students. I feel blessed beyond measure to have called the Solon Community School District my professional home for so long. Many, but not all, of the ideas on this blog were somehow related to my professional experiences and thoughts in Solon. Beginning in August 2018, I will transition to a tenure-track assistant professor of educational leadership at the University of Northern Iowa. In this position, I will teach aspiring principals, central office administrators and superintendents. Our mission is to develop and nurture reflective leaders of learning, service, and change in schools who positively impact students. After finishing a doctorate degree last year, I had no idea an opportunity in higher education would present itself so soon, and one that will allow my family relocate to a familiar part of the state while our three boys are (hopefully) too young to remember it. Mentoring and teaching future school leaders is a professional chapter I have been looking forward to for a few years. While I will begin writing more regularly in peer-reviewed journals as part of my new responsibilities, I hope to communicate even more frequently on this blog, too. Two articles were published in the February 2018 issue of School Administrator (AASA) describing university admissions office perspectives on standards-based grading (SBG). The full e-edition is available online and brief summary of each article is below. The authors interviewed admissions folks at several Midwestern universities with the purpose of determining if high school students experiencing standards-based grading receive a fair shot in the university admissions process. Three key findings emerged. Letter grades and transcripts based on standards are acceptable, if not preferable, by admissions folks, with a few caveats. When universities receive profiles/transcripts from schools with alternative grading/reporting systems, these students receive equal consideration. Due to limited personnel in the admissions office, grades and standardized tests are the most trusted measures. University admissions offices are aware of SBG and preparing to adapt, as needed. Voices from university admissions administrators across the country share their experiences with class rank, standards-based grading, and alternative reporting measures. For example, Paul Seegert, director of admissions at the University of Washington, says he does not believe students currently applying under a standards-based are at a disadvantage in the admissions process. If/when high school transcripts change, the general consensus shared is that admissions offices will need to be better prepared. However, the “fact that college admissions offices will have to make some adjustments should not deter high schools from pursuing meaningful reforms in the way they teach and evaluate students” (p. 29). Riede, P. (2018). Making the call inside admissions offices. School Administrator, 75(2), 26-29. 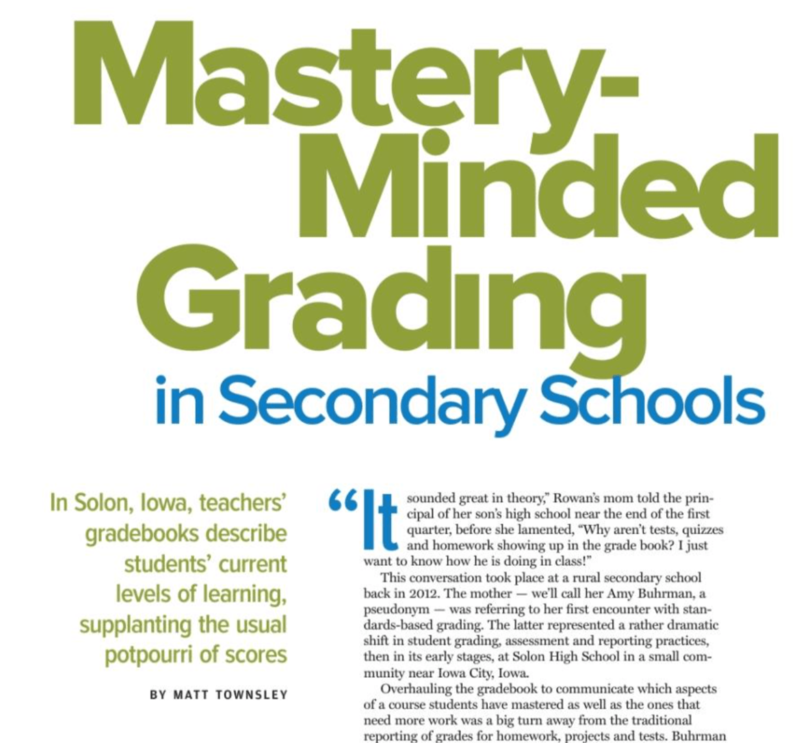 In Solon, Iowa, teachers’ gradebooks describe students’ current levels of learning without the customary array of A’s and C’s or numerical grades. The small district is at the forefront of a new assessment movement in some local schools known as standards-based grading. Read the entire February 2018 e-edition of AASA’s School Administrator publication or access the individual article here. In the last column, I proposed curriculum leads consider getting their feet wet and engaging teachers in a collaborative process to understand the nexus between standards, instruction and assessment in all content areas. This week, we’ll be taking a closer look at what it means to be a leader of data analysis. According to our organization, curriculum leads “assure all educators’ ability to use data to inform, implement, monitor, and evaluate results-based decisions.” At first glance, this function may seem like it’s all about spreadsheets, databases, crunching numbers and creating elaborate reports filled with pie charts. Sure, there’s a time and a place for disaggregating data to reveal gaps across subgroups. Without a doubt, curriculum leads should be providing assessment and other data in formats staff, parents and community members can easily understand. Our job is to use data to inform others. It is equally as important to “tell the story” about the data for the purpose of generating a solution or next steps than it is to merely crunch the numbers. Let’s be clear: our positions do not require an advanced degree in statistics or mathematics! Our ability to communicate through written language will directly impact our capacity to be leaders of data analysis. Here’s an example. Consider FAST (an early literacy assessment) scores in an elementary building indicating only 65% of students had met grade level benchmarks. If, during the previous school year, 45% of students had met benchmark, this year’s scores would be a huge celebration! On the contrary, comparing this data to the state’s healthy indicators for differentiated accountability (80% or more meeting benchmark is the universal target), the numbers may seem bleak. Clearly communicating these contextual comparisons can be helpful in sharing progress and next steps to stakeholders. We live in an era with more than enough educational data to fill weeks of endless number crunching. As a former high school math teacher, I naturally bend towards looking at the numbers in isolation rather than figuring out if there’s a bigger picture to consider. Instead, our job is to look at the data in its context, and ask (ourselves and others) compelling questions, such as “Is there anything else we need to know about these data points?” An example of this in my life happened last year when we noted a small drop in Iowa Assessment scores in several grades. It would have been easy to suggest our instruction or curriculum materials needed a boost, however after a closer look, we realized the areas we could most notably improve upon would require us teaching to the test rather than the grade-level standards (which is not something we were willing to do). Investigating the context around these data points lead us to a completely different next step. Using data to monitor and evaluate is important, too. At a recent AEA curriculum directors’ meeting, a few of us discussed program evaluation and the struggles that go along with effectively and efficiently evaluating various programs in our districts. Realizing program evaluation data does not always need to solely involve test scores was a helpful reminder. For example, my district uses several self-audits and continuums to identify our current level of implementation. We have a continuum to assess each team’s current progress towards our professional learning philosophy (i.e. power standard development, common assessments, data analysis, and action planning) that has informed professional learning and team goal setting during the past several years. Asking questions such as “To what degree are we implementing this practice with fidelity” may be a precursor to concluding the degree to which an initiative or classroom practice is impacting the expected outcomes. In closing, curriculum leaders are relentlessly building capacity in the school system to use data as a driver of informing, implementing, monitoring, and evaluating results and corresponding decisions. This function does not require advanced training in spreadsheets or mathematics! Leading data analysis does involve summarizing and formatting data in a meaningful way that will allow others to draw conclusions from the information in order to address a specific problem or challenge.